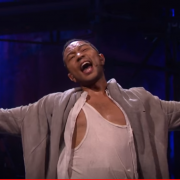 NBC's Jesus Christ Superstar got the song "Gethsemane" all wrong. Lindsey Paris-Lopez explores the real meaning of the "cup of poison" with the help of Dr. Anthony Bartlett's book, "Seven Stories: How to Study and Teach the Nonviolent Bible." As the controversy over the Supreme Court vacancy continues, Dr. Tracy McKenzie reminds us that the Founding Fathers intended a very limited role for the Supreme Court, and for it not to be easily swayed by popular demands and passions.